People of Greenpoint, be warned: a gourmet, style-conscious criminal is at large, and ready to steal your clothes. Only your finest pieces, though. 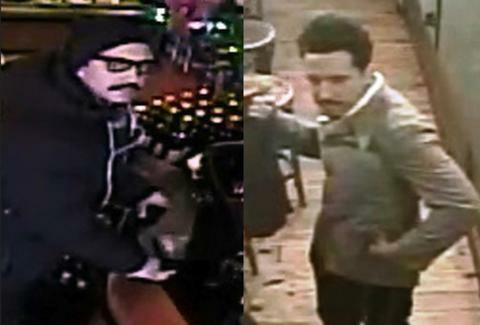 DNAinfo reports that a mustachioed, glasses-sporting "hungry hipster" stole an A.P.C. topcoat, Oliver Peoples sunglasses, and a Jack Spade wallet from diners at Mediterranean restaurant Anella on January 1st. So, clearly, The Hungry Hipster has a good eye, and, at least from the security footage, kind of looks like Fred Armisen. And probably has a solid fashion blog. The suspect is said to be 5ft 10in and in his late 20s or early 30s. Bemused Anella manager Salvador Rios said, "He didn’t look skeevy or weird or awkward, he looked like a regular Greenpoint kind of person." Except that that is, like, exactly what a regular Greenpoint kind of person looks like. Time to fully embrace normcore and start exclusively going out in Patagonia fleeces, if you haven't already, because there's no way this bohemian malcontent would be caught dead in those rags. Clutch those A.P.C. tags tight, because The Hungry Hipster is still at large. Lucy Meilus is an Editorial Assistant at Thrillist and would like The Hungry Hipster to know that she only has bad clothes, and he definitely wouldn't want them. Follow her on Twitter.